There are many soldier Gods in different border areas where the Indian Army operates. Most of the shrines dedicated to these Gods are situated in inhospitable terrain and mostly placed out of bounds to the civilians. There are no hymns or keertans sang on behalf of these Gods, they do not have ashrams, they do not ride in luxurious sedans, they do not hug devotees, they do not run charitable institutions, and they do not give darshans, and so on. They are soldiers who sacrificed their lives in service of their motherland and now regarded as patron saints guarding the areas where they achieved Martyrdom. On my first assignment to the Kashmir Valley as a young Captain in 1987, my belief in the God Almighty was rekindled mainly because of the inhospitable terrain, sub-zero temperatures, heavy snow-falls, avalanches, thin air with deficiency of Oxygen, high-altitudes above 10,000 feet, and the drive through the mountain roads where one could slip off the road, down the gorges, and no trace would be left of the vehicle or the passengers. I was attached to a Punjab Battalion as the Artillery Observer. The battalion had troops mainly from Punjab, Himachal and Jammu, consisting of Hindus and Sikhs. 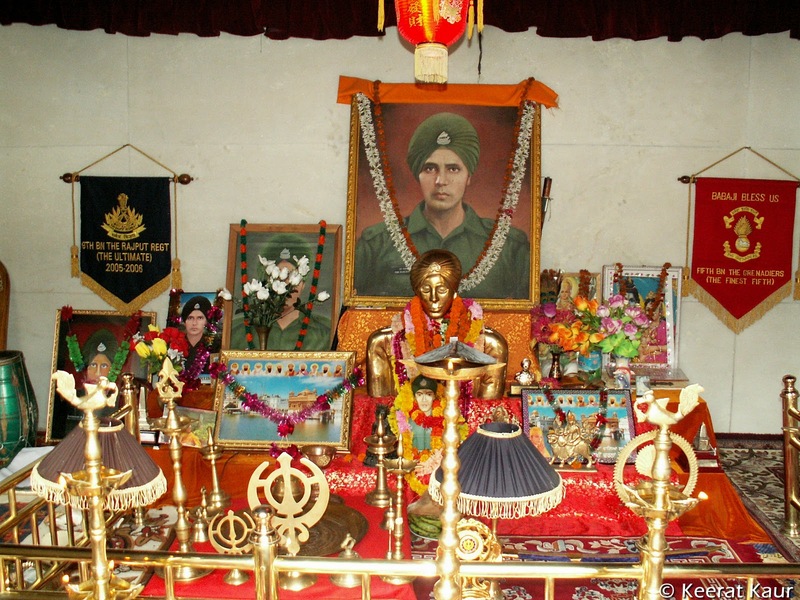 As per the norms of the Army, the battalion had a Mandir with a Hindu Pundit and a Gurudwara with a Sikh Granthi. On Sundays or on important religious days we attended both Mandir Parade and Gurudwara Parade. These being Parades, it was mandatory for all officers and men to attend. On the way to the battalion headquarters, there was a Muslim Peer Baba and every man, irrespective of their rank or position, used to stop and pay their respects to the Peer Baba before proceeding to the battalion. The belief among the troops, passed down over the decades of army deployment, was that the Peer Baba took care of the soldiers and in case anyone failed to stop and pay respect, he will meet with some tragedy. Being a Christian by birth, I said the Lord’s prayer in the mornings and evenings, a ritual embedded in me by our father. This was the place I understood the meaning of secularism and realised that all Gods were the same. I was never sure as to who saw me through my first Kashmir tenure, the Gods in the Temple, the Gurudwara, the Peer Baba or Jesus. During my later years of field service in Sikkim and in Siachen Glacier, I came across two Soldier Gods. Siachen Glacier, a disputed territory between India and Pakistan, the highest battlefield of the world, is well known for its inhospitable and treacherous terrain, freezing cold at -40 degrees Celsius, crevasses and avalanches and lastly enemy action. Statistics reveal that more lives have been lost to the weather than to the enemy action since 1984, when the Indian army first occupied the Siachen glacier. Hypoxia, High Altitude Pulmonary Edema (‘high-altitude sickness’ or HAPE), bone-chilling winds, sun burns, chill blains, frost bites, the thin air and sub-zero temperatures inducing acute depression, are the some of the weather factors affecting our soldiers. Most of the soldiers serving in such areas become very religious and the trust in their Gods really multiplies. There are many a myths and legends about the Siachen Glacier, like any other battlefields. Legend has it that OP (Om Prakash) Baba, deeply revered by troops posted in these glacial heights, was an army soldier who fought valiantly to preserve Indian frontiers from Pakistani intruders in the most adverse situations. 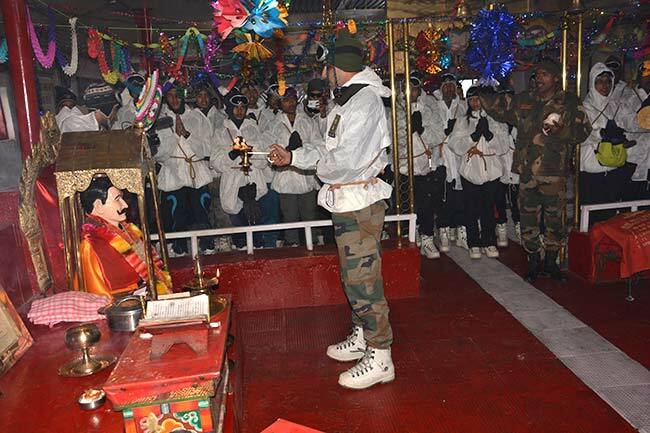 The belief in the soldier saint is so strong that a formal report is given to OP Baba before the induction of a soldier party on the glacier and after the successful accomplishment of any mission. Any officer moving into the area reports his arrival to the Baba by visiting the shrine and paying his respects. The faith in the legend of OP Baba is so strong that all troops give up consumption of alcohol and tobacco during their stay on the glacier as the Baba is believed to have been a strict disciplinarian and expects the same from fellow soldiers who come here to guard the frontier. Every battalion or company before taking position begins with a prayer at Baba’s shrine. The company commander gives a detailed briefing to Baba before tying a brass bell in the complex, taking a vow to keep away from cigarettes and intoxicants and fight the enemy till the last breath. The personnel keep the promise till the last day of their tenure in the glacier and is strongly believed that any deviation is met with instant punishment from the legend himself. It is believed that a night before any imminent danger, the Baba comes in the dreams of soldiers and warns them of such eventuality. The Baba has always been with the troops and protects every soldier and warns them of any impending danger in the Glacier. Baba Harbhajan Singh has defeated death. Believe it or not but it is true, one of its kind of story in the world- a man from an Indian Army in Nathula border in Sikkim, is still doing his duty even after his death some three decades ago. 60km from Gangtok towards the Nathula Pass lies the valley of Kupup. Here is the shrine of Baba Harbhajan popularly known as Baba Mandir. Baba Harbhajan has been guarding the international boundary of the two Asian giants, China and India over the last three decades. But believe me he does it alone. The Baba warns about the dangerous activities on the border through the dreams of fellow soldiers. Legend has it that even the Chinese soldiers confirm sighting a man riding a horse all alone, patrolling the border. Born in Brondal village of Kapurthala, Punjab, Harbhajan Singh joined the 23rd Punjab Battalion on February 1966 as a Sepoy. On October 4, 1968 Sepoy Harbhajan Singh was escorting a mule caravan from his battalion headquarters and he fell into a fast flowing stream and was drowned. Search for Sepoy Harbhajan was made with no results it was on the fifth day of his missing, his Commanding Officer had a dream of Sepoy Harbhajan Singh informing him of his tragic incident and his personnel weapon being under the heap of snow. Sepoy Harbhajan Singh desired to have a Samadhi (memorial) made after him. The Commanding Officer ignored the dream as an imagination but later when the personnel weapon of Sepoy Harbhajan Singh was found at the spot where he had informed, the Commanding Officer was taken aback and to mark respect and towards his wish a samadhi was constructed there. Here too, the belief in the soldier saint is so strong that any officer or soldiers moving into the area report their arrival to the Baba by visiting the shrine and paying his respects. On my arrival at Sikkim, Colonel PK Ramachandran, our Commanding Officer, realising my rational stands on such issues had advised me to visit the Baba Mandir. He said that my visit to the Baba Mandir may mean nothing to me, but will go a long way in upholding the faith of the men under my command. I did as ordered without realising the implications of his words until I read a research paper by a US Army Doctor on Post-Traumatic Stress Disorder (PTSD) suffered by operationally deployed US Army troops. I realised that cases of PTSD were the least in the Indian Army despite all the operational commitments and I can attribute it only to the faith in God by our troops and the role played by the myths and legends and patron saints of different areas. This may also be the reason for increased evangelistic activities reported among the US Military personnel deployed in operational zones. St George is patron of soldiers, cavalry and chivalry and he is the patron saint of England, Georgia, Lithuania, Portugal, Germany and Greece. He has no biblical significance. He held the rank of a tribune in the Roman army and was beheaded by Diocletian for protesting against the Emperor’s persecution of Christians. St George was adopted as the patron saint of soldiers after he was said to have appeared to the Crusader army at the Battle of Antioch in 1098. He is usually represented on horseback in the act of spearing the monster which is vomiting fire. It is based on a myth that in Sylene, a city of Libya, a lake was infested by a huge dragon, whose poisonous breath would kill anyone. The citizens could never draw water from the lake and in order to keep the dragon away, every day a virgin was sacrificed to it. One day the turn came for Sabra, the king’s daughter, to become its victim. 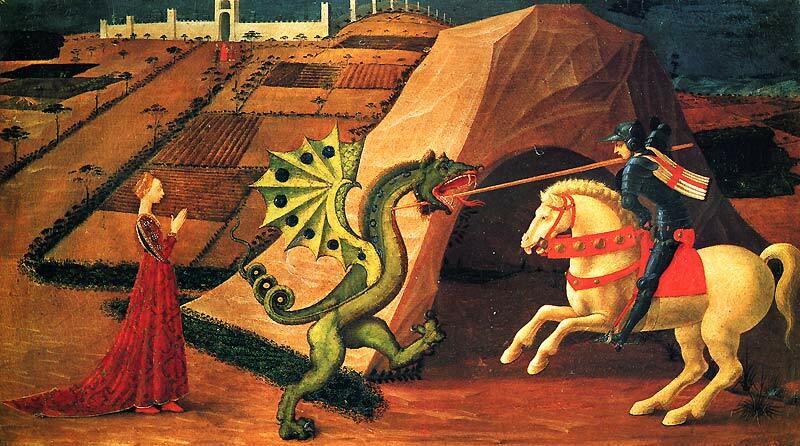 She was tied to the stake, and left to be devoured, when St. George appeared mounted on his charger and is believed to have killed the dragon. Many similar stories were transmitted to the West by Crusaders who had heard them from Byzantine troops. The banner of St George, the red cross of a martyr on a white background, was adopted for the uniform of English soldiers possibly in the reign of Richard I, and later became the flag of England and the White Ensign of the Royal Navy. In 1940, when the civilian population of Britain was subjected to mass bombing by the Luftwaffe, King George VI instituted the George Cross for ‘acts of the greatest heroism or of the most conspicuous courage in circumstances of extreme danger’. The award, which is second only to the Victoria Cross, is usually given to civilians. The award consists of a silver cross. On one side of the cross is St George slaying the dragon, with the inscription, ‘For Gallantry’; on the other appear the name of the holder and the date of the award. After setting foot in India, British Army built its first fort in Madras (now Chennai) in 1644 and christened it Fort St George after their patron saint. this has been posted before? Good read. Faith in anything we do or undertake is the most important factor in the success of anything . Another good article from you. It is question of faith which we humans have painted with the colour of different religions. Supreme Commander is only one. Every one is there own supreme commander. Dose this means any logical thinker have no place in the Army? Do we use Gods & Saints to hide our incompetency? Saints are made by us as a money collection center. One of the biggest Saints in my community had done nothing to mankind or for the nature but able to collect lakhs of rupees daily. So any one can be transformed as God or saint if a group is there to support. Probably one day Reji & I will be Saints, who knows? You have done it again! So true about our faith in Pir Babas and our commitment to secularism. I was a non believer before i joined army .And ist posting being in an Ahire unit, the troops being ardent believer in Lord Krishna, i too became Krishna Bhakt for the very reasons as elaborated by you! This can happen only in Armed Forces!! Good one Reji. You took me back to my Siachen & Sikkim days. Well written Reji.. brought back some similar memories. I have some incredible personal experiences of Baba Harbhajan in Sikkim. Also in Rajasthan border on an LRP with BSF and in J&K during my command of the Regt ( which saved my life). Was it a hallucination? I like to believe that it was God’s mercy. Good One Reji. FAITH is the word. FAITH is world. Incidentally, HQ ATNK&K Area is now Dakshin Bharat Area and is located in Island Grounds and Not in Fort St.George. You may wish to check on it. Thanks for your information. Updated self and the blog.